The SciBucs Teen Science Café was started in the Spring of 2017. We started with two members for our teen leadership; Emma Edmund and Chrissy Augustine are the founding members of our Café. We started the Café as a way to bring teens from our school and other local high schools together to share unique learning experiences they might not be exposed to in the typical classroom setting. Our school, Berkeley Preparatory School, has an extensive alumni network of fascinating professionals that would be willing to share their story or their work with our teens. I felt that they were a great resource for presenters. 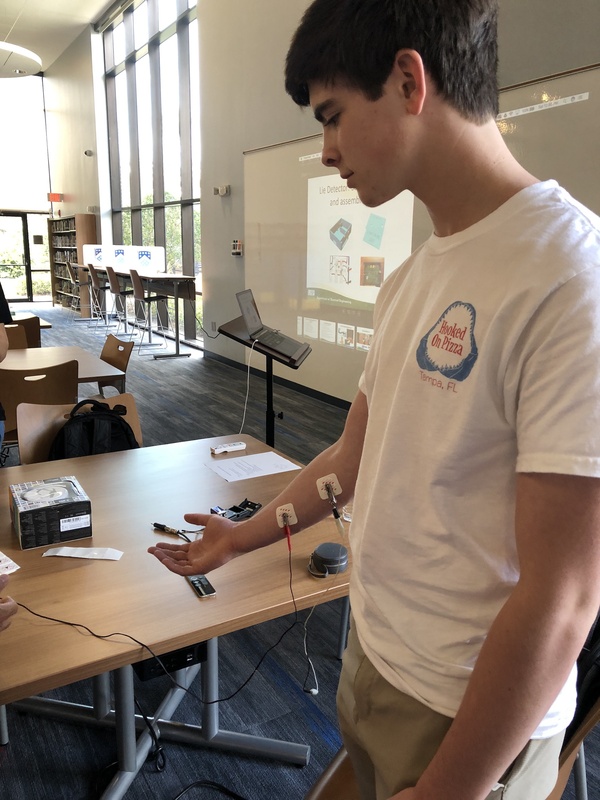 Electrodes connected to a teen’s arm. The activity consisted of one ten controlling the other teen’s muscle movement sending stimuli through someone’s clenched fist to make someone else’s hand twitch. 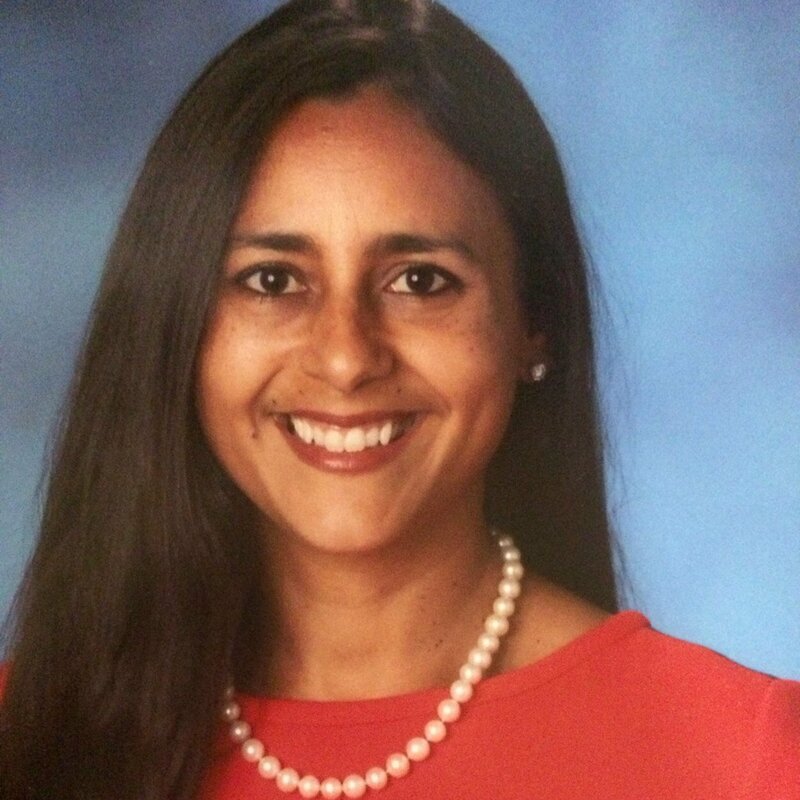 I am the Honors Biology and AP Environmental science instructor at Berkeley Preparatory School. I have a Masters of Public Health and worked in that field prior to teaching at the high school level. I have been a classroom teacher at this school for 11 years. One of my students a few years ago mentioned that she was going to a Café at Mote Marine in Bradenton. I was very curious about the Café and was excited to hear what she had to say about it. The idea of an organization that provides teens with the opportunity to hear first-hand from scientists and researchers, while also developing leadership skills was what really drew me in. Now more than ever teens are being asked, “what’s your passion?” For some, that question brings a sense of panic and stress. Most teenagers don’t know what their “passion(s)” is/are. Some teens haven’t been exposed to enough life experiences to make a commitment to one “passion”. Teen Science Cafés can give the teens a sneak peek into a wider range of professions and or experiences. You never know what will spark an interest. Berkeley Preparatory School is the school I teach at and they agreed to provide us with the venue for our cafés. The Science Department at Berkeley Preparatory School has graciously sponsored the food for the two Cafés we have held. Our school’s mission is: Berkeley puts people in the world who make a positive difference. 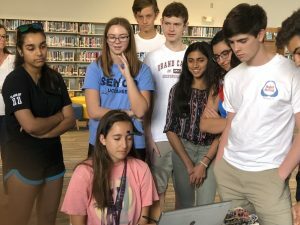 Our SciBucs Teen Science Café program aims to spark an interest in a teen that would eventually lead them to make a positive difference in the world. At first, our team did not know how to find or approach a presenter. Once we were connected by chance with our first speaker, the next hurdle was securing a date and hoping that kids would show up to the event. Our first Café had 8 kids in attendance. Our second café had 13! One major stumbling block we encountered was having a presenter agree to doing a Café, going through the motions of agreeing on a date, developing the presentation, etc. Then for no apparent reason we never heard back from the presenter, even after multiple attempts at contacting her via email. Since we have only had two, its’ hard to pick. We liked them both. Our first Café was more of a Q&A with presenter after her talk, but the last one was unique in that the presenter brought several engaging activities for the kids to interact with. That presenter, Stephen Saddow, led a café titled Cutting Edge Topics in Electrical and Biomedical Engineering. One of the presenter’s grad students brought a device he is working on that can let you move a computer mouse by just moving your eyes, designed for a paraplegic or someone with a disability and can’t move their arms to type on a computer. Another activity the kids really liked was a kit by the company Backyard Brains. The kit modeled the technology in neuro-prosthetics using the electrical activity from your brain to control muscle contraction. 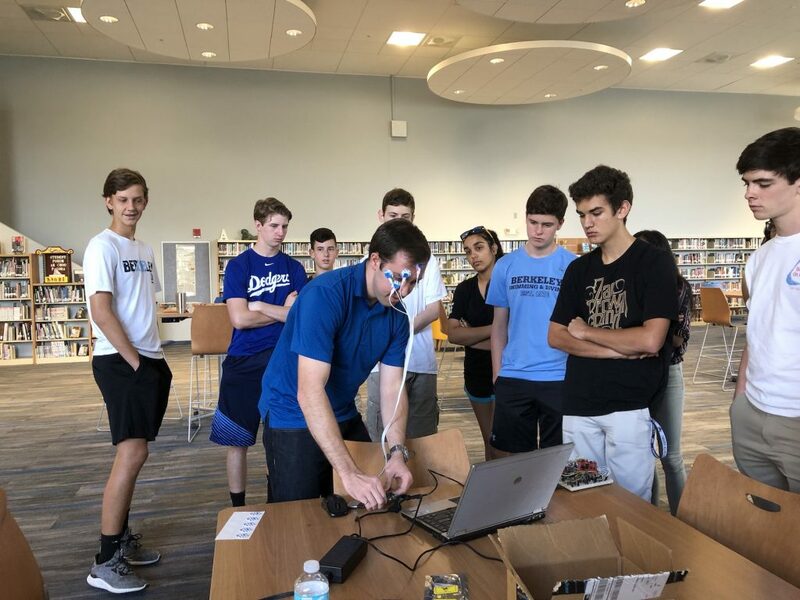 USF grad student showing the teens his project, a type of 3D printed glasses that use eye tracking to move the mouse on a computer so quadriplegics can surf the internet. I am excited that after our last Café, I have 5 new teens that want to be part of the leadership team. Two of these kids will be participating in an engineering summer camp that our presenter runs at USF (University of South Florida)- I’m happy with the connections that the kids have made with the presenter. Another bonus is that our school has a great facility that can accommodate various types of presentations. We have a brand new library and state of the art laboratory space. Just get started, even if you only have two kids! Below I share an interview of Emma Edmund. She is a graduating senior and one of the founding members of the SciBucs Café. I wanted her to share her experience with you and with our future members. In what ways has the Café impacted you? In my work in the Café, I have been able to learn about fields of science that high school students never get exposure to, from biomedical engineering to satellite imaging. Learning about different scientific fields from the Café has created a clearer idea for me in what I would be interested in pursuing further, in college and beyond. Even for someone like me—someone who doesn’t necessarily want to enter a scientific field—the Café provided an outlet to gain a clearer understanding of the world around me. Brain electro wave-type tracker that, in a quiet space, can tell when you are relaxed and creates certain corresponding images on screen. What did you enjoy the most about participating in the Sci Bucs Teen Science Café club? I enjoyed most creating the bridge between my school and scientists in the area. I loved being able to see how much my peers learned from scientists on the forefront of innovative discoveries. All of the hard work that goes into each Café session leads to vast increases in knowledge for everyone involved, including the teen leaders. What recommendations do you have for our teen leaders next year? Don’t be afraid to put yourself out there. As a teen leader, you are in charge of interviews and the smooth functioning of the Café, a daunting task, no doubt. But everything you put into the Café will be repaid with interest if you are eager to take risks, by, for example, reaching out to a high-ranking professional or creating an outreach plan with other organizations in the area. The Science Café offers you a particularly rare opportunity to improve your writing, interviewing, planning, and advertising skills, and it is up to you to take advantage of what the Café can teach you.